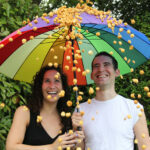 Albert Bartlett, the UK’s leading fresh potato supplier, is celebrating their 70th anniversary. 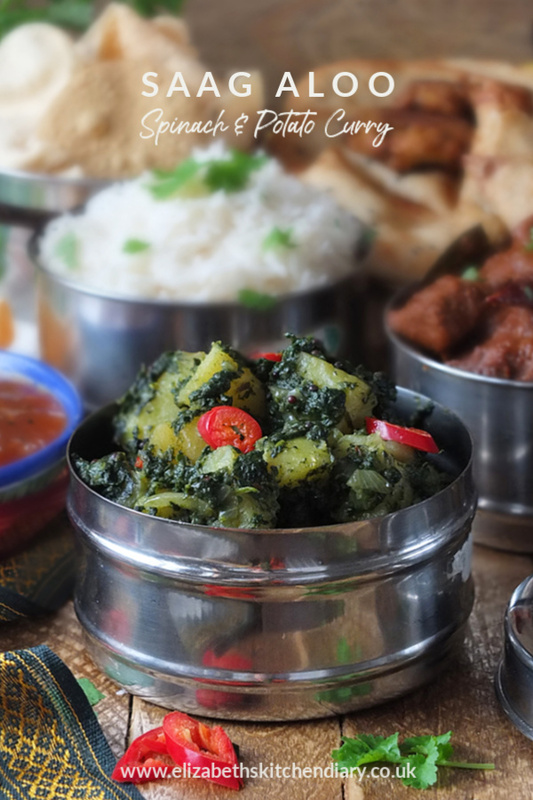 To help celebrate, I’ve recreated a popular recipe from the 1970s, when the Indian takeaway in the UK began to surge in popularity: saag aloo, or spinach & potato curry. In collaboration with Albert Bartlett. In 1948 Albert Bartlett worked as a basket weaver on Clydeside before moving to Coatbridge where he invested in £30 in an old water boiler and cast iron bath to set up a beetroot boiling operation. He began supplying beetroot to the local community. Fast forward 70 years and the Albert Bartlett brand is now the leading UK supplier of fresh potatoes. 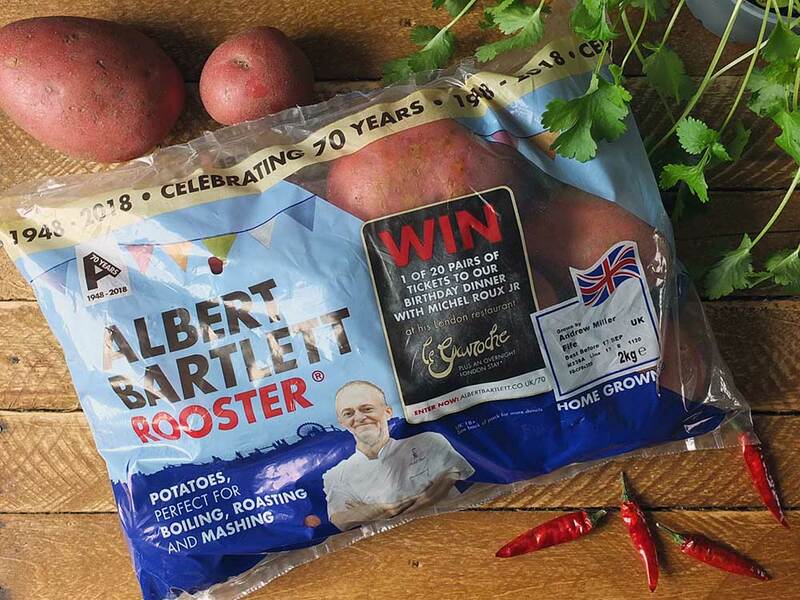 To celebrate, selected food bloggers have been asked to recreate a recipe from one of each of the decades Albert Barlett has been in operation; something showcasing Albert Bartlett’s Rooster potatoes. I have been challenged to re-create a recipe from the 1970s. 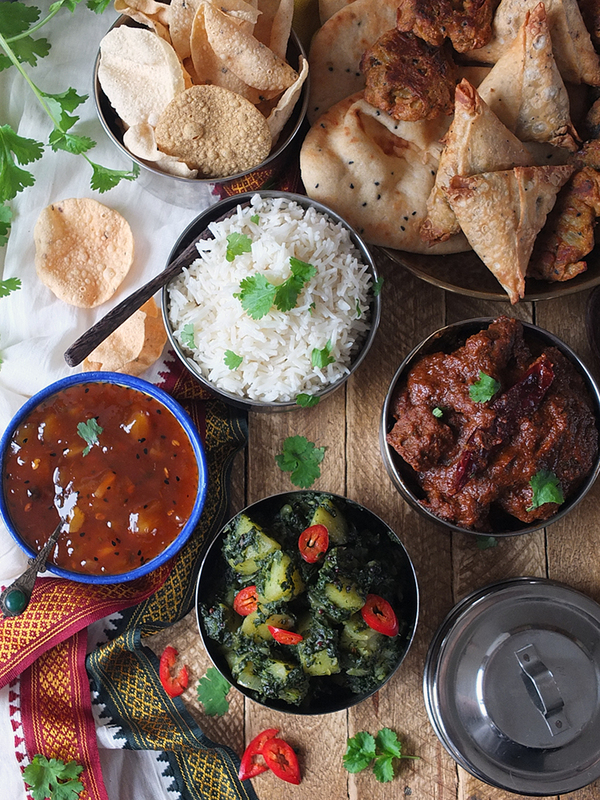 In the 1970s the Indian takeaway soared in popularity in Great Britain. Up until the start of the 70s, there were only around 1200 Indian takeaways throughout the UK, and three-quarters of these were owned by Pakistanis. After the Bangladesh War of Independence in 1971, Britain received thousands of Bangladeshi immigrants fleeing the violence. By the end of the 70s, there were over 3000 Indian takeaways across the country, the majority of them owned by Bangladeshi families. Menu items included chicken tikka masala, korma, madras, rogan josh, jalfrezi and vindaloo. Tandoori cuisine also arrived in the UK around 1970. 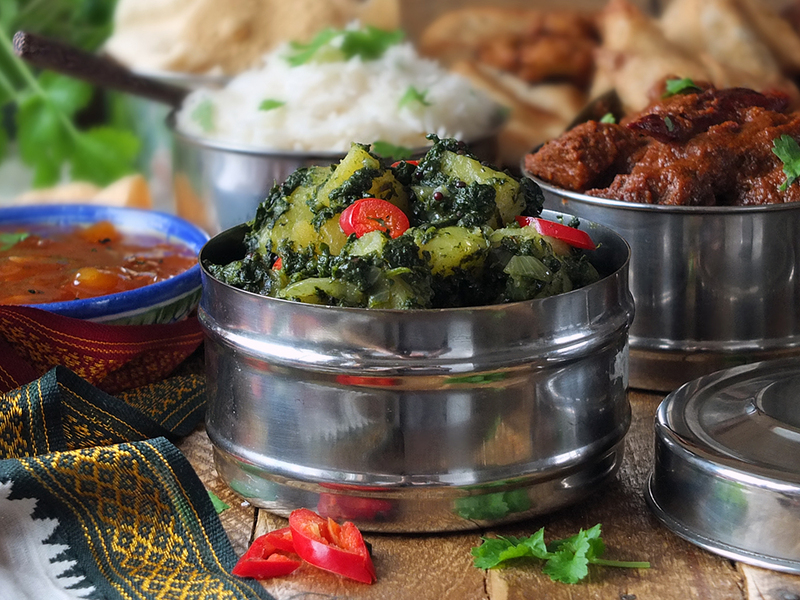 The Balti is thought to have originated in Birmingham during the late 1970s and chefs are credited with creating the dish to suit western tastes. 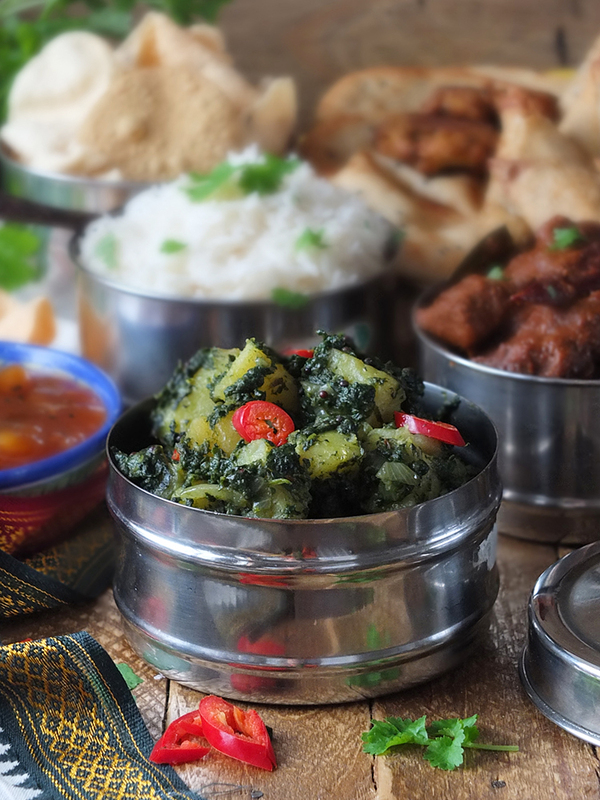 Saag aloo, or spinach and potato curry, was a popular vegetarian option. For my recipe, I’ve adapted Madhur Jaffrey’s recipe from her 1973 cookbook Madhur Jaffrey’s Indian Cooking to my own style, using fresh spinach instead of frozen, and adding in fresh ginger root and more spices, namely cumin seeds and turmeric. I hope you like it! To celebrate their 70th anniversary, Albert Bartlett is producing retro-looking bags for its fresh Rooster crop. The packaging for the 2kg bags of Albert Bartlett Roosters has a vintage look; look out for them in your local supermarket. 1948 -1950s: Albert Bartlett & Sons (Airdrie) Ltd was founded by Albert Bartlett. 1960s – 1970s: The factory expanded and the company began to supply carrots, onions and potatoes to various supermarket chains. 1980s – 1990s: The Watt Street factory was extended and developed to support the growth of sales of Scottish potatoes. 2000 – 2010: The company specialized in potatoes and began building the Albert Bartlett name as a consumer brand. 2011 – 2018: The brand expands into America, and a frozen potatoes range is launched. 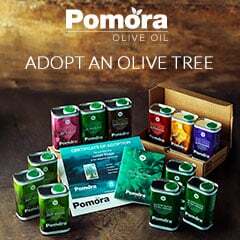 It remains an entirely independent brand, with the fourth generation now working in the business. fresh spinach leaves – lots of them! It’ll cook down so don’t worry. 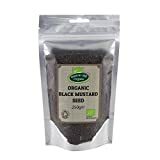 black mustard seeds – this is my favourite spice! 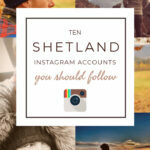 You can get this at Scoop Wholefoods here in Shetland. 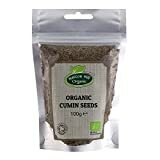 whole cumin seeds – this is my second favourite spice! 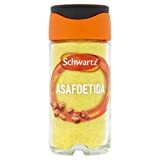 asafoetida – use sparingly; a pinch is enough. 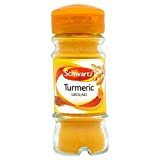 Look out for this in the spice section of your supermarket. cayenne pepper – feel free to adjust the quantity to taste. Step 1: Wilt your spinach in a large pot with a little bit of water. Drain, squeeze out the excess liquid and chop finely. Step 2: Peel and cut your Albert Bartlett Rooster potatoes into 1-inch cubes. Step 3: Heat oil in a saute pan and add the black mustard seeds, cumin and asafoetida. Step 4: Add sliced onions and finely chopped garlic and ginger. When soft, add cayenne and turmeric. Step 5: Add the potatoes. Step 6: Add the chopped spinach and a little more water. Pop the lid on, turn the heat down and cook until the potatoes are tender. 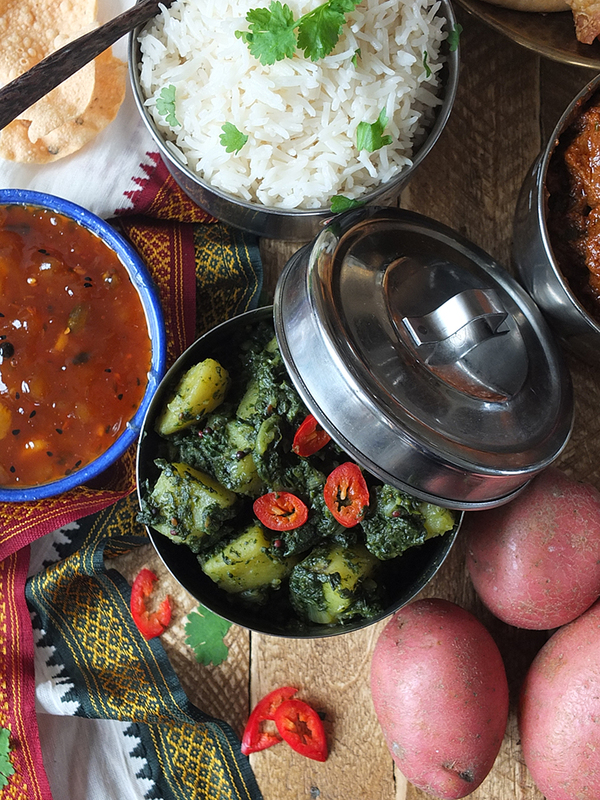 Serve your saag aloo with a selection of other Indian dishes, such as a lamb or beef rogan josh, some naan bread and a side of rice. Me, I like mine with plenty of fresh sliced fresh chillis sprinkled on the top, served with my favourite Indian sides – pappadoms, mango chutney, naan and pakoras. 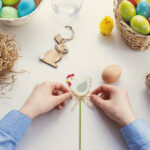 To help them celebrate their 70th birthday, Albert Bartlett is inviting 20 pairs of lucky winners to a special birthday dinner hosted by their brand ambassador and celebrated chef, Michel Roux Jr. It will be held on Saturday 1st December 2018 at his world-famous Michelin-Starred restaurant, Le Gavroche, in the heart of London, where he has been serving their potatoes for over a decade. So he knows a thing or two about quality spuds… click here to enter! I’m a potato fan, me – I absolutely love them. Last night we had a pile of creamy Albert Bartlett mash topping our family fish pie dinner (I might have had two helpings! ), earlier this week it was used to top a shepherd’s pie. I love them baked with baked beans and plenty of grated cheddar cheese, I love them in soup (especially tattie and leek) and I love them fried in butter with black mustard seeds and plenty of freshly ground black pepper. I also love mashed potatoes. Mashed potatoes and gravy are one of my favourite comfort foods, and I remember when I was pregnant with my first born I couldn’t even wait for the potatoes to cook – I’d use Smash instant potatoes. Smash was super popular in the 1970s, did you know/do you remember? What’s your favourite way to eat potatoes? Let me know in the comments! 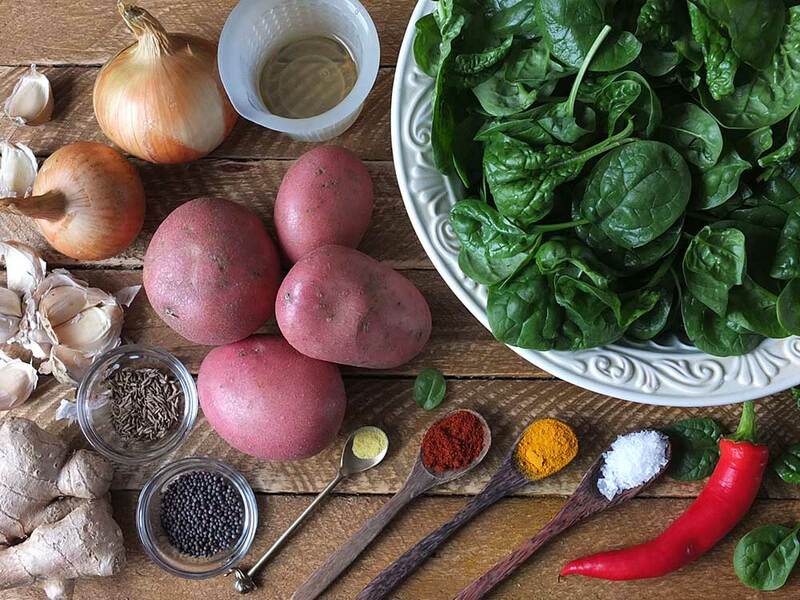 A simple yet incredibly delicious potato curry recipe made with fresh spinach, Albert Bartlett potatoes and plenty of spices. Serve with Rogan Josh, naan bread and some rice. Place the spinach in a large pot along with 50 ml of water. Cover, and turn the heat on to medium. Cook until the spinach wilts. Drain well and chop finely. Set aside. Meanwhile, peel and dice the potatoes into 1 inch cubes, peel, halve and finely slice the onions and finely chop the garlic and ginger. Heat the oil in a large saute pan and add the black mustard seeds, cumin and asafoetida. When the black mustard seeds begin to pop, add the sliced onion, garlic and ginger. Saute for two minutes and then add the cayenne and turmeric. Stir to combine. Add the cubed potatoes and the chopped cooked spinach along with 2 tbsp of water. Stir well. Pop the lid on, turn the heat down to low and cook for 40 minutes, until the potatoes are tender. Check every ten minutes or so to make sure there's still liquid in the pan, adding a little extra water if needed. 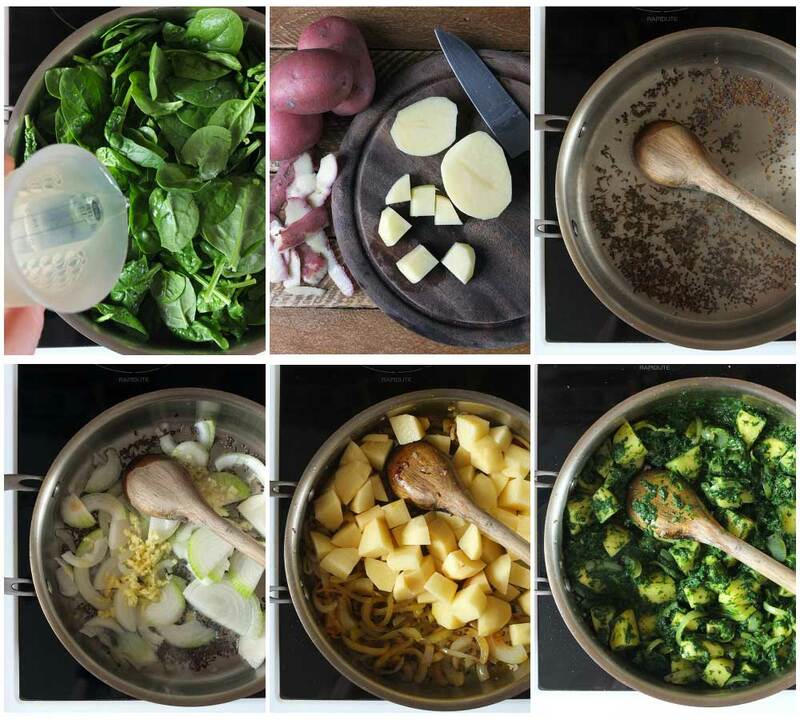 PIN THIS SPINACH AND POTATO CURRY FOR LATER! This is a sponsored recipe post in collaboration with Albert Bartlett potatoes, although all thoughts and opinions expressed are our own. Thank you for supporting the brands who make it possible for me to do what I love: mess up my kitchen and share recipe stories. 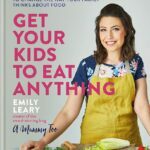 great recipe and vegan as well ! I do love a nice curry ! Looks so yummy. I put sweet potato in a curry but never think about normal ones! This looks delicious! I love a good curry but haven’t actually tried Saag Aloo. I really need to! 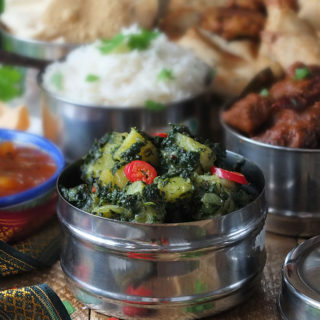 This looks delicoius, I love Saag Aloo but have never tried to make it. 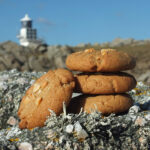 Will definitely be giving your recipe a whirl! Oh and my favourite way to eat potatoes is when they are perfectly roasted – crispy on the outside and soft and fluffy on the inside. I absolutely love Saag Aloo! I always buy it when I’m ordering curry. As a vegetarian, it’s the perfect side. This recipe looks really yummy, I’ve never tried to make it myself before but it looks simple enough. Great looking recipe. I love the sound of this recipe. A massive bonus is that it is vegan friendly! Yum. 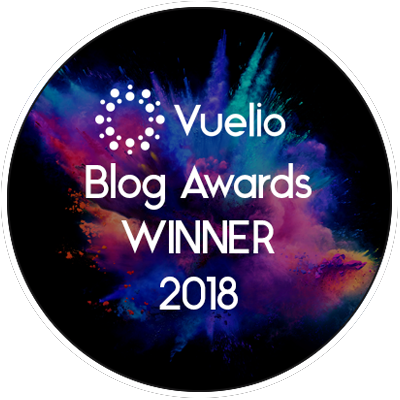 I have to admit I love a good curry and this one sounds really delicious, which some different ingredients than I normally think about when it comes to curry!